You know that video is a powerful medium when it comes to connecting with prospects and customers. While you’re using it to think outside the box, consider using it inside the box – that box being your business. Thanks to video’s visual nature, it serves as an effective medium for communicating large amounts of information that is better absorbed and retained. This makes it a great training resource for any department- saving time, maximizing efficiency and eliminating the need for long drawn trainings. Here are a few examples of how you can keep continually educate and empower your employees with the help of video. Shorten on boarding time and quickly get new hires up to speed on policies, procedures and product. With OneMob’s video and voice messaging platform, new hires can quickly access a library of video assets that cover everything they need to know from corporate policies to benefit programs and more. Managers also can ensure that employees watch the videos and comply with on boarding procedures by tracking viewer statistics for each new team member. Upload your existing product update videos or tutorials. This type of content will educate and enable your reps to knowledgeably discuss your product and better communicate those benefits in sales or customer calls, meetings or on the trade show floor. For companies with wide spread teams or a growing product with changing offers, frequent and current video content will keep everyone on the same page. Keep them brief, easy to digest and varied in topics. When stored in the OneMob cloud, reps can quickly access videos for quick refreshers whenever they need, from the web app or their mobile devices. Once employees are transitioned and trained, the improvement doesn’t stop there. Through video, managers can easily share knowledge with multiple people at once, and educate new and existing reps on current market trends, best practices and further professional development practices. When it comes to improving tactics, OneMob is a great tool for reps to practice with. 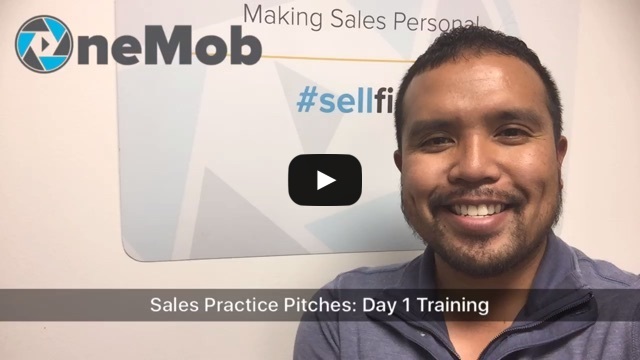 Reps can record their practice pitches, mock conversations or sample voicemails and send to managers, who can then reply with feedback, all in one loop. This gives managers insight into how their reps are pitching to prospects or addressing customer needs and allows them to gauge performance, address problems and adjust trainings- with greater efficiently and impact. The possibilities of getting creative with video training are endless. To get inspired by our video examples, see our support page. If you’re not already training your employees with video, get started with OneMob today.